“Bill Monroe: King of BlueGrass Music,” interview with Doug Benson in Ewing, Tom, The Bill Monroe Reader, 2000. Remembered as the “Father of Bluegrass Music,” Bill Monroe is better understood as a master chef or chemist, blending earlier musical elements into an exciting new form. Bill often spoke of wanting to bring “ancient tones” into his sparklingly innovative music. These included fiddle and bagpipe sounds imported from the British Isles, African-American blues and holiness gospel, American Great Awakening hymnody, as well as hill country dance music and the thrilling new rhythms of hot jazz. His distinctive contribution was blending these influences with an equal measure of his own passionate soul and artistic inspiration to create and evolve what would become a genre of its own, named in honor of Monroe’s band, the Blue Grass Boys. It can fairly be said that every bluegrass band on earth draws inspiration from the musical contributions of Bill Monroe. Bill Monroe was the youngest of eight children born to a western Kentucky farm family in Rosine, Ohio County, not far from Owensboro. Suffering from crossed eyes that weren’t corrected until his teens, the young man endured teasing and vision difficulties which haunted him for life. The family loved music, and Bill proved an apt performer on mandolin, guitar, and vocals. He left school in the fifth grade, began work as a laborer at 11, and was orphaned at 17. Soon after, he joined older siblings in the Chicago area, where he found work in the oil industry. A few years later, he and brothers Charlie and Birch became exhibition square dancers for the WLS Barn Dance. Charlie and Bill left their day jobs in 1934 to form the Monroe Brothers, the hottest of the mandolin-guitar duets popular in that decade. Radio, concerts, and recordings, mostly in the Carolinas, launched the duo to prominence with songs such as “What Would You Give in Exchange for Your Soul,” “Drifting Too Far From the Shore,” and “New River Train.” The brothers quarreled and split in 1938. Bill decided to modernize and enlarge his musical vision with a larger string ensemble, which he eventually named the Blue Grass Boys in honor of his home state. In 1939, on the strength of his adaptation of Jimmie Rodgers’ “Mule Skinner Blues,” he was inducted to the Grand Ole Opry on WSM, Nashville, as a life member. Over the next five decades, Bill Monroe led a band through which scores of talented musicians served their apprenticeship. Among Blue Grass Boys alumni who made their later mark in bluegrass, country, folk, and other genres were Clyde Moody, Howdy Forrester, Stringbean (David Akeman), Carl Story, Chubby Wise, Lester Flatt, Earl Scruggs, Benny Martin, Jim Eanes, Don Reno, Vassar Clements, Mac Wiseman, Jimmy Martin, Gordon Terry, Carter Stanley, Sonny Osborne, Bobby Hicks, Kenny Baker, Don Stover, Eddie Adcock, Dale Potter, Buddy Spicher, Del McCoury, Bill Keith, James Monroe (Bill’s son), Peter Rowan, Richard Greene, Byron Berline, Doug Green, and Roland White. The sound that came to be known as bluegrass wasn’t born fully formed. It constantly evolved as Bill Monroe merged his creative inspirations with the talents that passed through his band. In the late 1930s and early 40s, the Blue Grass Boys played in a raggy, syncopated, and improvisatory style that evoked black string bands of an earlier era and the simultaneously emerging form of western swing. During this phase, the fiddle became the central voice of the instrumental ensemble, and high-pitched solos, duets, trios, and quartets provided a rich variety of vocal material. With Earl Scruggs’ entry into the Blue Grass Boys in 1945, bluegrass music first took on the classic five-piece ensemble for which it has ever since been recognized: plucked string bass, steel-string guitar, mandolin, fiddle, and banjo played in the three-finger style that Scruggs made wildly popular. During the three years that Bill Monroe, Lester Flatt, Earl Scruggs, Chubby Wise, and Howard Watts were together, their performances and Columbia recordings set a standard that have ever since been recognized as a high water mark for the form. After Flatt & Scruggs split off to form their own group, Bill Monroe took his sound in new directions. Autobiographical songs, faster tempos, a more dynamic instrumental attack, and eventually double and triple-fiddle arrangements characterized the great music the band made for Decca in the 1950s. In his fifties and a veteran performer, Bill Monroe wasn’t content to rest on his laurels. As the folk music craze swept North America, the traditional roots embedded in his music brought it to the attention of new audiences in the colleges and urban centers outside the heartland of the Appalachian region and mid-south where bluegrass had flourished. The 1970s and 1980s saw the proliferation of bluegrass festivals, labels, radio programs, and media. 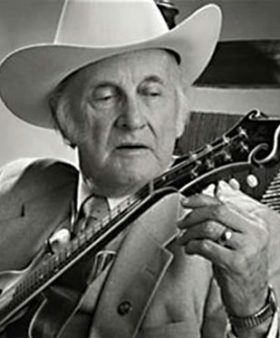 Bill Monroe was the recognized patriarch of an entire genre of music, which was by then spreading worldwide. In the final quarter century of his life, Bill Monroe received the recognition and approval of peers for which he had hungered as a child. 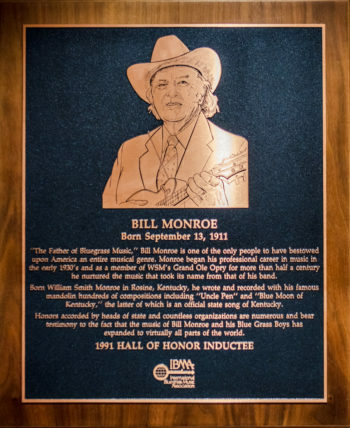 The broader world of the arts and culture recognized Bill Monroe as one of the leading innovators and musical figures of the twentieth century. The “Father of Bluegrass Music” died a few days short of his 85th birthday after a series of health challenges, through which he continued to perform for appreciative audiences almost to the end. In June, 1985, at Shoney’s Restaurant in Nashville, paid the tab for lunch at the meeting that led to formation of the International Bluegrass Music Association. 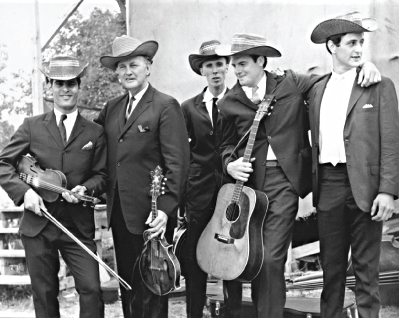 From the Archives: Left to Right: Gene Lowinger, Bill Monroe, Lamar Grier, Peter Rowan and James Monroe. Photo by Ron Petronko. 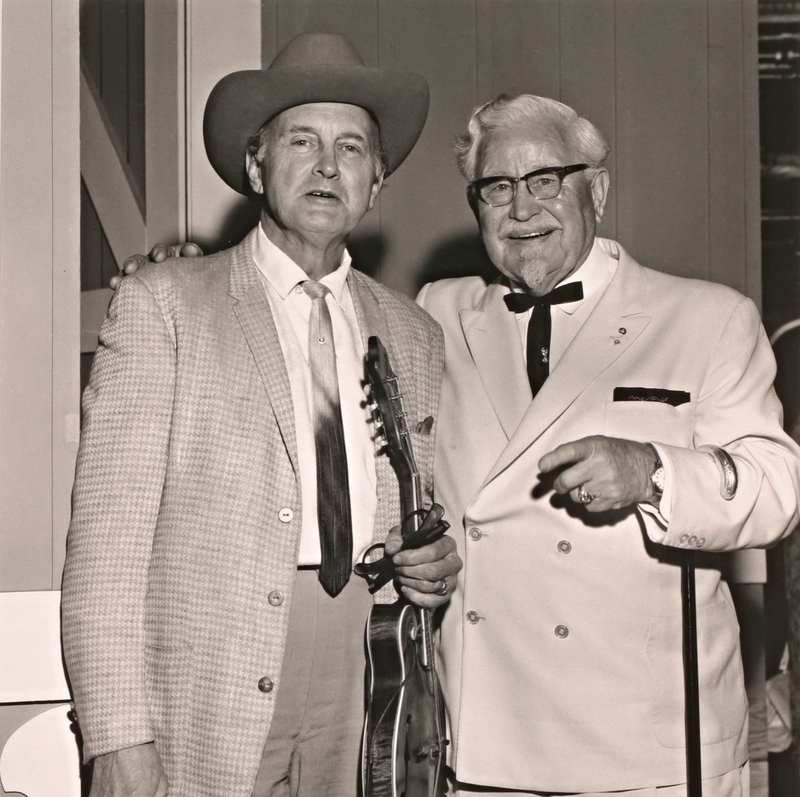 From the Archives: Bill Monroe with Colonel Sanders. Photo by Les Leverett. “Bluegrass Touches – An Interview with Bill Monroe” by Charles Wolfe, in Ewing, Tom, The Bill Monroe Reader, 2000. “Bill Monroe” (interview) by George Gruhn, in Ewing, Tom, The Bill Monroe Reader, 2000.